Brielle Historical Museum is based in the former town jail and weigh-house. 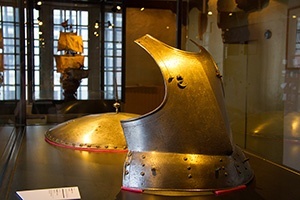 The museum’s display places the capture of Brielle on 1 April 1572 in the context of the Eighty Years’ War. The Sea Beggars won their first victory over the Spaniards on 1 April 1572 with the capture of Brielle. This had a domino effect: various Dutch towns felt steeled in their battle against the Spanish oppressor. Brielle was the first taste of freedom (Libertatis Primitiae) and Alva lost his spectacles (a pun on the fact that ‘bril’ in Dutch means ‘spectacles’). You can see, hear and experience lots about the Eighty Years’ War in the museum: what role did Johan van Oldenbarneveldt and Prince Maurits play (listen to their servants), and what was Treaty of Münster in 1648? Who was Alva and what was his Inquisition? What did ‘heretic’ mean in those days? In the past the Weigh-house (Waag) was used to weigh goods, often using a double balance with two scales. This part of the museum now covers the celebrations of 1 April 1572, an event that takes place annually in Brielle. But there is much more to be seen. Extensive attention is paid to Brielle’s maritime heroes: Admiral Maarten Harpertszn Tromp, Admiral Cornelisz Witte de With and Admiral Philips van Almonde. 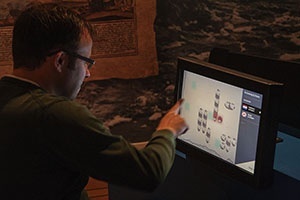 An interactive game helps visitors learn more about life at sea in the 17th and 18th century, and you can participate in a sea battle. The museum also displays a number of fabulous portraits in the portrait gallery in the Brielle treasury by artists including David Bailly and Justus van Egmond. 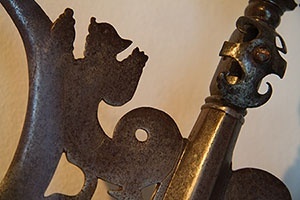 Consideration is also given to those who played a key role in founding the town of Brielle: the Lords and Ladies of Voorne, local aristocrats who granted land from their estate to individuals in the 13th century, leading to the development of Brielle. Finally archaeological finds tell you all about the area in which Brielle is located from the Stone Age until the Middle Ages, and the unique finds that were found during the excavations on a former monastery site in the town’s old centre are on display. A fully preserved skeleton of a man from the 16th century can be seen in his original coffin, and the visitor can use a VR headset to experience 3D reconstructions of a number of rooms from the former monasteries and convents.